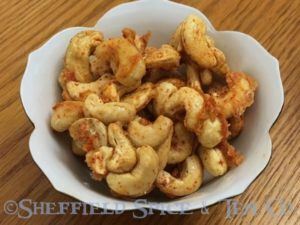 Sweet Chile Cashews are a perfect snack to munch on during your favorite sporting event on TV. They are also a great snack to have in bowls for your guests during the holidays, like Christmas, Thanksgiving, The Fourth of July, actually any holiday or gathering. Easy to make, with the sweetness of dark brown sugar, and the spiciness of mild or hot chile powder. We use New Mexico Red Chile Pepper we buy direct from the grower in Hatch, New Mexico. The best flavor anywhere. New Mexico Red Chile Powder adds a chile flavor you can’t find in store-bought chile powders. So good, you might want to make a double batch. 1 or 2 Teaspoons Mild New Mexico Red Chile Powder, or Hot New Mexico Red Chile Powder, depending on the spiciness you want. Preheat oven to 350F. In a medium mixing bowl, combine the dark brown sugar, salt and chile powder. Mix well. Add the egg white and whisk until frothy. Add the 2 cups of raw cashews. Toss to coat. Spread the cashews on a parchment lined, low-sided baking sheet. Bake 20 minutes until golden brown. Remove from the oven and let cook completely. You are ready to enjoy. Store any leftover in a container with a tight lid. But, we doubt there will be any left over to store.